At Alianza Sheet Metal LLC we use the latest technology to ensure the best results in duct manufacturing. This technology and our experienced team ensure a highest quality work and customer service along with good pricing. We manufacture ducts and their fittings in round, flat oval, and rectangular configurations. The round and flat oval configurations are available with either single-wall or double-wall, insulated construction. Rectangular ducts and fittings are available as unlined single-wall, insulated single-wall, or insulated double walls. These are all available in a range of diameters, lengths, gauges, and metal types. The fittings we use are designed to have minimum static pressure loss. Skilled craftsmen use the latest fabrication techniques and equipment to ensure that our fittings are of consistent quality, resulting in low leakage and easy, accurate field assembly. 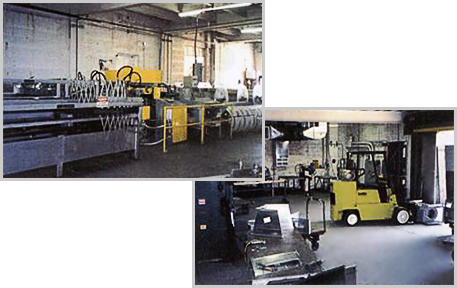 We also manufacture TDF systems, slip and drive systems, round pipe systems, and crimp connection systems. The TDF Duct System works by roll forming sealable flanges on transverse duct ends during the manufacturing process. The TDF flange, formed on the machine's left-hand auxiliary, has unique snap-on corners that eliminate the need for spot welding. We also provide corners, clips, and gasket tapes. The fabrication standards of the TDF system allow the use of thinner gauges. For example, for a static pressure of 2' you can use gauge #26 in ducts of 60". The difference of sheet consumption is very significant. Example gauge #26 represents a 27.6% less weight than gauge #24 in pounds per square foot, and that is the same percentage from gauge # 24 to gauge #22, saving 49%!. TDF ducts can be assembled in floor and at various elevations at the same time. In traditional ducts this is not possible because the slip and drive can be harmed when transported, and has to be built up when elevated duct by duct. TDF ducts can also be assembled and separated without damaging the ducts. We also fabricate traditional slip and drive type, round pipe, and crimp connections. These include round pipe with a range of union types from square to round. Options include crimp connection, elbow, tees, reductions, and more. Al sheets are cut under the plasma cutter machine and deliver the best possible results with minimal consumption of sheet metal. We also sell all of the tools you'll need to install the new duct systems. We have building tools, glue, insulation, hangers, registers, louvers, insulation and more. We also offer connectors and special tool orders, but there are no returns on special orders. There is a 30-day return policy on all other tools.